Don Smith (California, United States) on 31 March 2009 in Landscape & Rural. One of the many rewards of teaching workshops is the opportunity to work with some extremely creative students. I would love to take full credit for this image, but it wasn't until I looked through the viewfinder of one of my recent participants, Michael Romo, that I was inspired to try my own vision of this scene. I have to preface all this by saying China Cove, located in the Point Lobos State Reserve near Carmel, California, is my wife's favorite spot! We used to have a large image of this cove hanging in our home (for reasons I cannot remember, it has been replaced). My lament has always been in finding the perfect foreground, and finding the perfect light. Fortunately both elements came together for this image. Recently the Reserve began opening and hour earlier than normal allowing visitors in at 8 am. This image was captured at about 8:30 am as the light was just starting to bring out the turquoise color of the cove. I've always loved how the multitude of colors allowed for the eye to move easily up and through the frame. Thanks to a blooming California lilac bush and the low skimming light, the image was complete - thanks Mike for the inspiration! Beautiful image! I don't know if you caught it, but the New York Times featured Pt. Lobos as a prime photographic destination in an article on Sunday. The author had been there when there were about a dozen photographers scrambling around-your last workshop, perhaps? Anyway, I hope it doesn't become spoiled by popularity. @Rick Trautner: Hi Rick, nice to hear from you. I did not see the article but it would not have been our workshop as we held it Monday - Thursday. I am no longer holding workshops on weekends due to the crowds. We finished at Point Lobos on Thursday with both morning and evening shoots and basically had the Reserve to ourselves. I hope you are doing well. @jamesy: Good morning Jamesy, Point Lobos is really a special location in so many ways, and based on the weather, it can provide year-round photographic opportunities. Don, beautiful spot - and this has very nice light in it - Great - I remember this cove from the workshop and I am still amazed by the water color - amazing in this area - I will have to go back soon! I like this composition and the foreground flowers are awesome! @Scott Schilling: Hi Scott, thanks! I just e-mailed you all the information about Utah. I wish I were there. Feeling like having a bath in the emerald sea. @zOOm: It would be a cold bath Florence, and you may have a few otters and sea lions swimming with you! Hi Don, this is exceptional. The blues and the greens in this shot are just superb. Thanks for sharing. @"Marie" :-): Hi Marie, not only is this location beautiful, but it is the multi-layers of colors that has always drawn my attention. Don, this shot is fantastic! will you replace the lost one with it? Don, I cannot remember, do you shoot in Raw format? and those two software programs you mentioned, what are they used for? I have a Nikon D70 and am trying to figure out what program to buy for editing my shots. Any suggestions? Your workshops are on my wish list, however, what type of lenses should I have for them? I only have a Sigma 28-300mm 1:3.5-6.3D and a Sigma DC 18-125mm 1:3.5-5.6D (nothing special). @Marion: Hi Marion, I do shoot all my landscapes in RAW format. The two programs mentioned above perform completely different tasks. Photomatix Pro is a High Dynamic Range software (HDR) allowing one to bracket images and later combine them to increase dynamic range, while Nik Software offers a multitude of software for sharpening, noise reduction, color enhancement, etc. If you click the links provided, it will take you to their sites so you can read further. As far as a basic editing program, have you looked into Adobe Lightroom? Lastly, in regards to the lenses you mentioned, you seem to have the range covered for most landscape needs. I carry lenses from 16mm - 300mm in my bag, with a macro and a 1.4x converter (which I rarely use). If you do decide to take one of my workshops, I can discuss all this in detail including filter suggestions. Let me know when you are ready and thanks for your continued support. Wow this is ne of the most beatiful places I have ever seen. Exellent photo! Wonderful light, beautiful colors, exquisite scene ... simply BREATHTAKING! @Judy: Good morning Judy, thanks for your nice comments. @Marie LC: Any French translators out there? Thanks Marie! Gorgeous shot! Absolutely exquisite light! @john4jack: Hello Jack - great light and great color are my top two priorities when creating landscape images. Add a great location and it becomes icing on the cake! Gorgeous photograph. Superb shades of blue and green. @Hema Iyer: Thanks you Hema. Wonderful shot. Nice that you mention the student's eye to catch it. Foreground, middle and back are all so beautiful. Seems surreal, and like a watercolor painting, almost. @LauraS: This was a case of the student teaching the teacher! 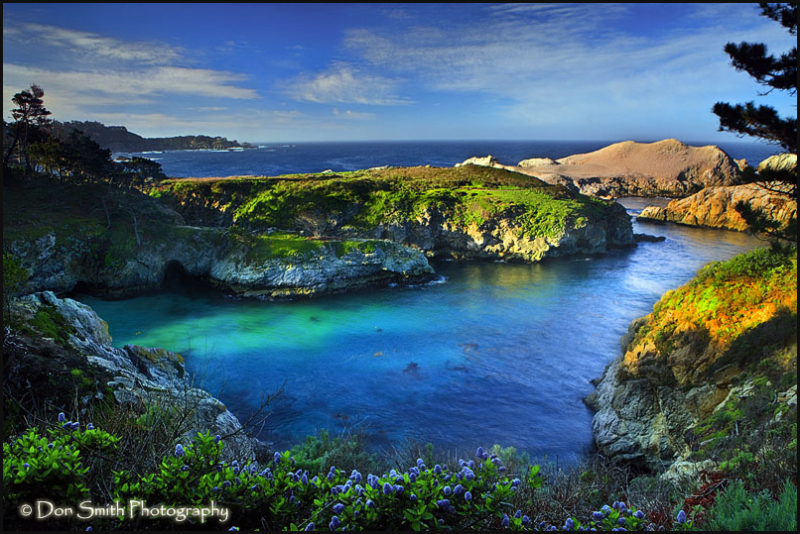 Just like McWay Falls, you have taken a familiar place and given it a new dimension! @Tracy: Thank you Tracy, my advice where you live so close is to be the first car in line as the gates open at 8am. That extra hour in the morning is what gave our group access to this great light - and it didn't last long! @Gary Hart: Hey Gary, I have been out the last couple days trying to shoot poppies without much success - too much wind or the poppies have closed up shop for the day - I will be back out again today. Great shot on your blog today! That image will haunt me (in a good way) for the rest of my days! @David: Thanks David - hope to hear from you again - much appreciated. That's my favorite spot as well. I visited Pt Lobos in 2000 for the first time, way before I ever got interested in photography, and on my first trip to the US, and it left a lasting impression and a memory. Last time I saw it few weeks back, the access to the beach below was closed after a storm and after stairs were destroyed. Is it still closed? @Ivan Makarov: Hi Ivan, the beach access is now open! Best to get there now before the tourist season begins. BTW - downloaded your PDF off your site - awesome work! Also, thanks for the plug on your site. wow! the colour range and its intensity here are amazing - magical really! excellent work as always! This is a spectacular view. @Ana Lúcia: Hi Ana, thanks for the nice words - hope you are doing well. Wow! Great view and great colors! @Eleftheria: Hello my young friend, you will have to convince your parents one day to bring you to California. I would love to meet your entire family. In reading the posts about poppies in particular, there is a huge crop (intentionally planted for sure) in the parking lot of the new shopping center in Marina where the REI,Target & Koles etc. are. Each time I have been there, though the wind has been blowing, but the number of poppies is stunning. It might be a nice place for some macro work if there's no wind??? Outstanding! The light is magnificent!